Blessed Mother Teresa of Calcutta will be canonized on 4th September, and the Missionaries of Charity and their friends are organizing an exhibition to take place in our library from 19th-30th April. The display will include some items belonging to Mother Teresa and an account of her life, witness and mission. Each day a film about her will be shown at 4pm in the Parish Centre. 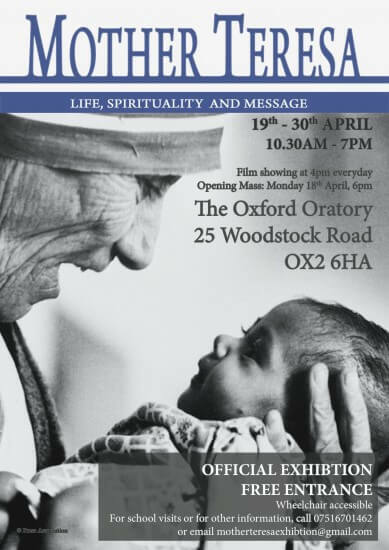 On Monday 18th April at 6pm there will be a special Mass to mark the opening of the exhibition.